The Maruti Suzuki Ciaz C-Segment sedan has just walloped over the 5,000 pre-bookings even as dealers around India are seeing big interest in the country’s largest automaker’s latest product. A Maruti Suzuki official has confirmed to CarToq that the Ciaz will be launched in India, on the 1st of October, giving the automaker the advantage of the upcoming long weekend, when test drives and bookings can be driven to a frenzy of sorts. The Ciaz is Maruti Suzuki’s replacement to the SX4 sedan, a car that never really took off at the hustings, after the initial promise that is. With the Ciaz, Maruti Suzuki is looking at turning around its fortunes in the C-Segment sedan market. 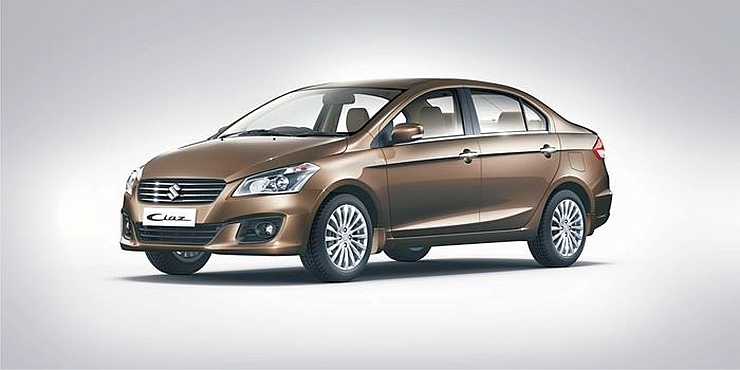 The Ciaz, easily the largest car in its segment, will be aimed straight at the 2014 Honda City. Knowing Maruti Suzuki’s value pricing approach to the Indian market, expect sharp pricing for the Ciaz, which perhaps could even undercut the City sedan by a sizeable margin. CarToq’s First Drive Review of the Maruti Suzuki Ciaz Sedan. The Ciaz will be sold with petrol and turbo diesel engine options. Based on the Ertiga MPV’s underpinnings, the Ciaz will also use engines and gearboxes borrowed from the Ertiga. 1.4 liter K-Series petrol (91 Bhp-130 Nm) and 1.3 liter Fiat Multijet turbo diesel (89 Bhp-200 Nm) engines will be offered on the Ciaz. 5 speed manual gearboxes will be standard on both engines while the petrol motor will also be available with a 4 speed automatic transmission option. The Ciaz will offer decent equipment levels that are par for the course in the segment where the car operates. Three point seat belts, twin airbags and ABS+EBD are the major safety features on the car. In terms of creature comforts, automatic climate control, push button start, keyless entry, rear AC vents, spacious interiors, rear sunshade and reading lamps, ambient lighting, touchscreen infotainment, front and rear armrests, and leather upholstery are the various options on offer.